We have been practicing as a community for six weeks now and have learned several different practices. This week, we would like to review the practices we have learned so far and suggest one way to practice them as an ongoing rhythm of life as followers of Jesus. In week 1, we practiced Lectio Divina, which is an ancient practice that stems from the belief that Scripture is alive and active (Heb 4:12) and seeks to help us listen for what God’s word is saying to us in the present moment through the Holy Spirit. A typical way to practice Lectio is to use the Read, Listen, and Repeat method. In week 2, we practiced Noticing. Jesus taught us to seek the kingdom of God, but the first step in doing so, is noticing the kingdom. So often, we believe the kingdom is somewhere else, but it is, as Jesus taught in his kingdom parables, in our very ordinary moments, daily routines, and day-to-day relationships. One way to practice Noticing is to ask God for eyes to see, believe that the kingdom is all around you, and then be attentive to the moments in your day that its presence is manifest, writing down where you noticed the kingdom. In week 3, we practiced The Open Chair, a way of understanding the process of spiritual transformation by arranging two chairs, one for us and one for God. Between these chairs is our soul, a thing to be restored to Christlikeness and wholeness when we bring our brokenness and openness and God brings his grace, power, and forgiveness. One way to practice The Open Chair is to arrange the chair as a tangible reminder of God’s role in your transformation, sit quietly and listen for what God is speaking to you, and read Scripture verses that remind you of God’s promises to restore and transform you. In week 4, we practiced Forgiveness, which is at the heart of the kingdom of God and what it means to be a follower of Jesus. Forgiveness, however, is a difficult and messy practice that happens in stages. One way to practice forgiveness is to first feel the pain of being hurt by acknowledging it. Then, stop fighting or attacking the person who hurt you, laying down your right to revenge. Third, pray for the one who hurt you and ask God to bless him/her in their life. Finally, as Jesus demonstrated how to love and forgive in John 21, bless or serve the person who hurt you in a tangible way. In week 5, we practiced Serving Others. Although we typically think of serving others as meeting a physical need, we know that Jesus taught us to meet both spiritual and physical needs of those we encounter. One way to practice serving in this holistic way, as Jesus did, is to immerse yourself in the verses of Scripture that describe how Jesus served, ask God to show you someone in your life who has a need, whether physical or spiritual, that you could partner with God to meet, and then serve the person God brings to mind or who crosses your path with the words, actions, and courage God grants you. Arrange the Open Chair. Pull an open chair up across from you to put yourself in a posture to remind yourself that God is seeking to transform you into Christlikeness and that you have a role to play and so does he. Read. Read the verse listed below for the particular day using Lectio Divina. Pray. Open your hands in prayer, asking God to give you eyes to see his kingdom and the ways you can join with him through your forgiveness and blessing of others, through serving someone in need, and in whatever other way he would invite you to participate. Listen. Sit silently for 2-3 minutes and listen for what God is speaking to you and seeking to transform in you. Respond. If God gives you actions to take, whether it is to forgive, to serve, to bless, or to take a step of faith in some other way, respond in obedience. Introduction. This week is Holy Week, the last week of Jesus’ life before his resurrection. The stories told about this last week are so familiar to us that we can be tempted to skip them and rely on our memories. But as Dallas Willard once said, “familiarity breeds unfamiliarity.” Let us not become so familiar with the story of Holy Week, Good Friday, and Easter that we become unfamiliar with Jesus himself. Indeed, we may think of the death and resurrection as something Jesus accomplished for the future, and it is this, but it is also something Jesus accomplished so that we can be in relationship with him now and participate in his kingdom now. It is the happenings of Holy Week that allow us to respond to Jesus’ invitation in our anchor text of Matthew 11:28-30. Lectio Divina. Our practice this week is one we have been practicing since we began gathering six weeks ago – Lectio Divina. We have listed below two passages of Scripture to engage with each day. The first passage is one from Holy Week and the second is our anchor passage from Matthew 11. One way to engage in Lectio is to Read, Listen, and Repeat. When you have completed this process, feel the freedom to sit quietly for a minute or two, or write down the words or phrases that stood out to you, or the invitation you heard God opening to you. This week, we are practicing serving others. Typically, when we refer to “serving others”, we immediately think of meeting physical needs. But Jesus was clear in commanding us to serve others in a holistic way – physically and spiritually. Often, we do one or the other. This week, we want to do both as Jesus did. In our gathering on Sunday, we read Luke 4:16-21, in which Jesus stunned those in his hometown synagogue by telling them that he was the fulfillment of the one prophesied in Isaiah 61. Specifically, Jesus told those gathered to hear him that the Spirit of the Lord had anointed him to proclaim good news to the poor; proclaim freedom for the prisoners and recovery of sight for the blind; set the oppressed free; and proclaim the year of the Lord’s favor. In other passages of Scripture, we read about Jesus meeting physical needs of those around him, but the times Jesus met a physical need, he also met a spiritual need. As we will see as we read through the Scriptures this week, he calls us to do the same. Read. Each day, start your quiet time with God by reading Isaiah 61:1-3, which relates to spiritual needs, as well as the other passage listed for that particular day, which relates to ways Jesus met physical needs. Ask God. As you read the daily passages, ask God to open your eyes to people in your life who have a need you could partner with God to meet. For example, “Father, is there someone in my life who is imprisoned by something – an addiction, a toxic relationship, a pattern of thinking? Are you inviting me to serve them in some way, whether with words of truth, an act of grace, a loving presence, or in some other way?” Be silent and listen. Serve. Pray that God would allow your path to cross with the person he brought to your mind or with someone who has a need and that he would give you the words, actions, and courage to serve that person. Then, serve them in the name of Jesus Christ, who has set you free. 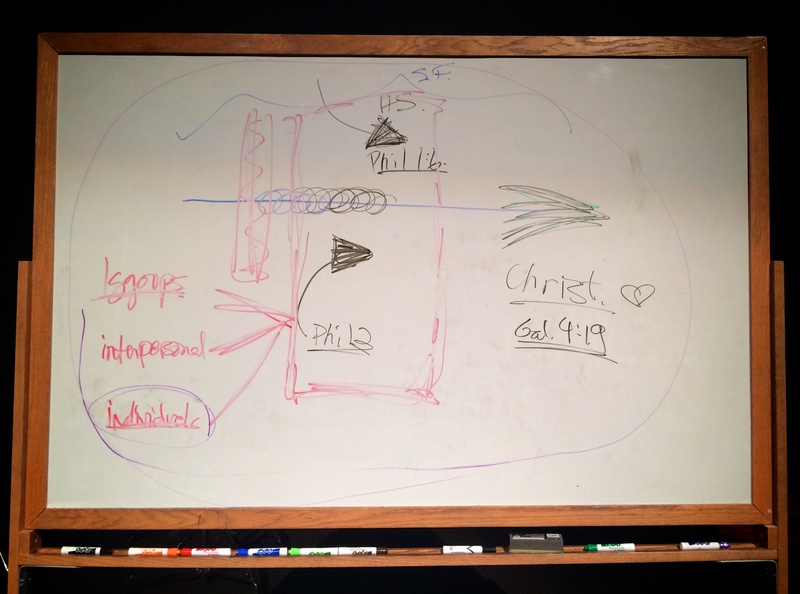 Last night we waded deeply into Jesus’ invitation to forgive our brother or sister from our heart. Through the wonderful and difficult story of The Unmerciful Servant (Matt 18:21-35), we asked God to show us (1) Who do I need to forgive?, and (2) What is my next right step of forgiveness? And like God always does, He met us in our stumbling steps toward Him. Hallelujah. But we all know that forgiveness doesn’t often happen in an instant, but through a long, messy, Grace-powered process. Jesus taught that we should forgive our neighbor 70 x 7 times, and that doesn’t happen in one Sunday night service. So our practice this week is to begin to become people committed to a lifetime of forgiveness. Let’s take the small, practical steps right now that align us with God’s Kingdom of grace, letting it go, and second chances. Here is our specific practice for the week: Hearing from God through another person. “Friend, do you see any unforgiveness in my life? Who would you say I still need to forgive?” And then taking the next right step toward forgiveness. One time this week, get together with a trusted friend and ask the wide open questions: “Friend, do you see any unforgiveness in my life? Who would you say I still need to forgive?” And then listen humbly. What is your friend reflecting back to you? Is he/she seeing a pattern with someone that you haven’t seen? What is God doing in your heart through this conversation? Feel. Do you simply need to let yourself feel the pain of being hurt/betrayed? Is it time to stop running, avoiding, or denying that you were hurt, and honestly feel it. Remember that you are not alone. Pray. As you feel the pain deeply and yet refuse to fight back, God may be inviting you into the next step: Praying for your “enemy” (Matt 5:43-48), and blessing those who curse you (Luke 6:28). Putting these words of Jesus into practice is one of the most difficult and freeing things we can do. 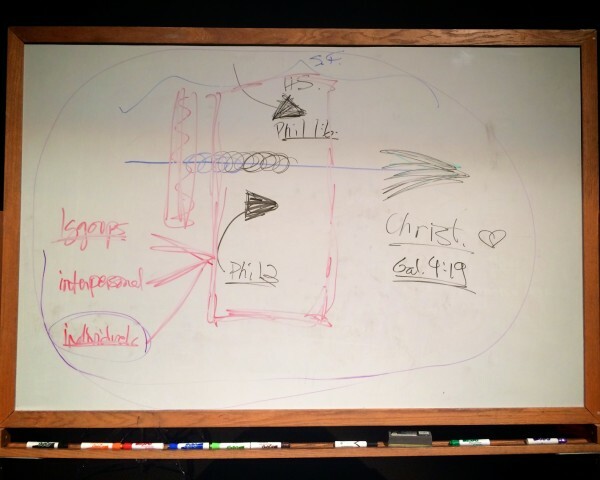 (1) Video: Shauna’s teaching at Willow on the unmerciful servant. (2) Book: “The Art of Forgiving” by Lewis Smedes. (3) Short video: Fr Richard Rohr about forgiveness. We are punished by our sin way more than we are punished for our sin. What if God is NOT a traffic cop waiting in the bushes to bust you if you drive 1 MPH over the speed limit? “We don’t come to God by insisting on some ideal worldly order or so-called perfection, but in fact we come “to knowledge of salvation by the experience of forgiveness” (Luke 1:77)—forgiveness of reality itself, of others, of ourselves—for being so ordinary, imperfect, and often disappointing. Many also have to forgive God for not being what they wanted or expected. One reason why I am so attracted to Jesus and then to St Francis is that they found God in disorder, in imperfection, in the ordinary, and in the real world—not in any idealized concepts. They were more into losing than winning. But the ego does not like that, so we rearranged much of Christianity to fit our egoic pattern of achievement and climbing. Isn’t it strange that Christians worship a God figure, Jesus, who appears to be clearly losing by every criterion imaginable? And then we spend so much time trying to “win,” succeed, and perform. We even call Jesus’ “losing” the very redemption of the world—yet we run from it. I think Christians have yet to learn the pattern of redemption. It is evil undone much more than evil ever perfectly avoided. It is disorder reconfigured in our hearts and minds—much more than demanding any perfect order to our universe. (1) For some of us, we need to begin by simply allowing ourselves to feel the pain of being wronged. Instead of running or avoiding and pretending, our first step toward forgiveness is to FEEL and ADMIT the pain in God’s presence. Maybe that’s as far as we can go right now. (3) For some of us, God is pulling us deeper. Not only will we stopping fighting them, but we’re ready to practice Jesus teaching and “pray for your enemy. Bless the one who curses you.” And so we want to begin actively praying for the person we need to forgive. Not that they would suffer or even change, but simply that God would bless them. And their family. And their lives. This is a very, very hard thing to do, but incredibly powerful. (4) And finally, for some of us, the next step is to make them breakfast (Matt 21). To find a concrete, no strings-attached way to bless and serve them. This will look very different in every situation, but God will lead us to do the right thing if we ask Him. • You have already seen our “Kingdom Practice” for the week (HERE at this blog), and our big encouragement is DON’T TRY TO DO THIS ALONE! First, remember that God has invited you into this process and promises to be faithful to complete the work God has begun. Second, it is absolutely critical to find a friend or tribe to walk with. Brothers and sisters who love us are one of God’s primary ways to heal and guide us. Please don’t try to do this journey alone. • Forgiveness is a life-long journey. All God is inviting you to do is take the next right step. • The song that accompanied our silent prayer time was “O Magnum Mysterium” by the Nordic Chamber Choir. This week, we are engaging in the practice of “the open chair,” which is a way of understanding the process of spiritual transformation. In this practice, we arrange two chairs, one for us and one that will remain empty in a physical sense, but which we place next to or across from us as a tangible reminder of God’s role in the transformation of our soul. Between these chairs is our soul, a thing to be restored to Christ-likeness and wholeness in partnership with God. God offers us his grace, forgiveness, and power. But he never forces these on us; we must slow ourselves, sit down in his presence, and bring our brokenness and openness to him. Sitting down in your quiet time with an open chair next to or across from you is a reminder that for transformation to occur, two people are required – you and God. God is inviting you to open your heart, surrender your control, and turn over your brokenness to his grace, power, and forgiveness. Arrange the Open Chair. In your time with God each day this week, pull up an open chair next to or across from the one you sit in. Quiet your body and take several deep breaths. Pray. Offer this prayer with your palms open: I am here in your presence, Lord. In this moment, I open my heart to your healing grace. I offer my brokenness for your forgiveness and redemption. I surrender my desire to control and command. Listen. Sit quietly and simply listen for what God is speaking to you. If your mind starts to run with thoughts of your day or to-do lists, take a couple breaths and pray the prayer above again to re-center yourself and try listening again. Read. Read the Scripture passages listed below as a reminder of God’s promises to restore and transform you. This week, we are practicing noticing where the kingdom of God is manifest. “To notice” means to perceive, become aware of, or acknowledge acquaintance with. Noticing the kingdom of God is the first step to seeking the kingdom of God (Mt 6:33). The kingdom of God can be sought after in our ordinary moments, daily routines, and day-to-day relationships. But so often, in our busyness and constant movement, or in our sin and inattention, we fail to see it. Starting each day with a prayer and then ending each day by writing down the ways in which you saw the kingdom of God in that particular day – whether in a person, a set of circumstances, a moment, or a place – allows you to become increasingly aware of the ways in which God’s kingdom is already apparent in our world, and the ways in which you can begin to participate in it. Pray. Each morning when you first wake up, pray this simple prayer: God, please give me eyes to see and ears to hear Your Kingdom today. Read. Allow God to speak about the Kingdom through the Scripture listed below using the Lectio Divina practice – read once, then sit silently for a minute and listen for the words or phrases that stand out to you; read a second time, ask God what area of your life these words or phrases relate to, and listen for two minutes; read a third time, ask God if there is an invitation or next step related to the words or phrases, and listen for two minutes. Write. Each night before bed, take a few minutes to write down where you saw God’s kingdom during your day. When you are done, express your gratitude to God for opening your eyes to his kingdom. So excited. We spent yesterday setting up the Willow chapel in preparation for our first gathering of The Practice this Sunday night. I can’t possibly convey how much we’re looking forward to this new adventure. Our goal for the chapel is to help it feel like a holy living room. Simple, reverent, and human. The chairs are set up in the round because we long to become a tribe together, and the Eucharist table is in the very center of the room because we know that Christ is the very center of everything. It’s simple, but hopefully the room will preach louder than any words. Becky and I even had the chance to run through some of the opening liturgy. Friends, we can’t wait to dive into this with you. Hello everyone! As you know, we’re meeting for the first time on Sunday, March 9th. (More info here) We’ll gather in the chapel to hear the heart behind this experiment, worship together, and begin practicing the way of Jesus. Please join us. Everyone is welcome! The only requirement is that you have a deep desire to engage with Jesus and learn the unforced rhythms of grace. We don’t exactly know where God will lead each of us, but it has the potential to change everything. 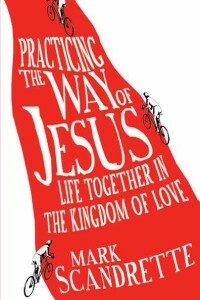 Before the 9th, please take a few minutes to read this chapter from Mark Scandrette’s “Practicing the Way of Jesus”. Mark beautifully articulates why practice and prayerful action are central to the life of a Christ-follower, and he shares stories of how his community actually lives it out. Our journey will look different here in Chicagoland, but the heart is the same. You’ll LOVE his passion and creativity. And then, if you’d like to go deeper, check out the two books below. There is truly no one who has formed our understanding of spiritual formation and the Kingdom of God more than Dallas Willard. 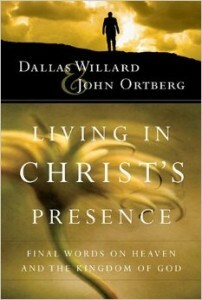 And Living in Christ’s Presence is one of the final teachings Dallas gave at the end of his life with John Ortberg. Absolutely brilliant. If you’ve never read Willard, this is a great place to begin. You’ve already read the first chapter, but I highly recommend picking up the whole book. Not only does he offer a compelling vision of life with Christ, but Practicing the Way of Jesus is packed with stories and stories about how they actually, practically, experimentally, creatively, and courageously live it out.